Is Lottoz a Scam or Legit? Read 2 Reviews! Wouldn’t you be annoyed if you clicked on a subscription to get that 35% discount on your US Powerball tickets, cancelled it three months later and then got charged back that discounted amount? That was just one of the things that caught my eye in the terms and conditions for playing international lotteries online at Lottoz.com. This is an online lottery provider that offers straight ticket lines and combo packages. There are no syndicates. It does look fairly straightforward. So, what do they actually offer? Each of the different 17 lotteries offered online by Lottoz.com have a minimum purchase of two ticket lines. Five of the lotteries earn a free ticket, but there is a minimum purchase of ticket lines required for each. Buy 3 ticket lines of US Powerball and get a free ticket versus buy 5 lines of EuroMillions and then get a free ticket. The free ticket is automatically generated as a quick pick. Lottoz also offers monthly subscriptions for all their lotteries with difference discounts ranging from 10% (El Gordo) up to 35% off (US Powerball). To opt out, simply send an email at least five business days prior to the renewal. The terms and conditions underline that is the player’s responsibility to ensure the email was received. Lottoz.com will also take back any discount that a player has gotten as a result of the subscription and charge you with the difference. There is no information on how long a player has to be involved not to get the charge back. Lottoz.com offers some combinations if players aren’t quite sure what they want to play. These are packages of different lotteries where ranging from two lotteries and five tickets (American Combo) up to five lotteries and thirty-seven tickets (VIP 100 Combo). Tickets are chosen randomly/quick picks. Who Can Play at Lottoz.com? Have you noticed the phrase “interstate activity in the United States of America” in some of the terms and conditions on a few sites? Lottoz is another one of these. It looks like it refers to the fact that players are not supposed to transport lottery tickets in the United States from state to state. I’m not sure what that has to do with getting an online lottery provider to purchase a lottery ticket in the US – say for Powerball – and hold it on their behalf of the player. Lottoz.com’s services are not available in Israel though it doesn’t say Israelis can’t play here. And of course, you have to be a legal age to play wherever you are. If you have questions, there is an email address and online form. They do answer fairly quickly. There are no phone numbers. Their “live chat” appears to never be online and any message defaults to their UK address (they have some sister European play only sites) and it doesn’t appear that anyone answers. Lottoz.com is owned by a company out of Malta with a snail mail address though it looks like it is a mail drop. There are also twitter and facebook links. 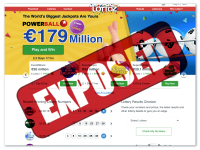 Getting past the lack of ways to communicate with Lottoz, this looks like a fairly straightforward place to play international lotteries online. They do respond to emails pretty quickly though it would be nice to see someone online on their “live chat”. There is also the question of how long you have to be involved in their subscriptions prior to having to pay back your discount. This site gets a reserved thumb’s up. It is a fairly new site so maybe they will add some additional features like syndicates in the future plus strengthen their communication options. Tried to bet and wanted to take my money. Said I had an account but asked for password recovery couldn’t get it. Tried live chat and it didn’t work and tried landline number and that didn’t either. So to me this is not a valid site. Hey, I am from India playing with this lotto betting site, last few months is need to add more features or updates to add more features to makes the site more user friendly, like, 1.more payment methods, especially, E-wallet payment methods, 2.latest version live chat, 3.strengthen security system, after all, this is new site, but, Ok for reliable playing.